With hockey sidelined for a few days, there’s no excuse for Vancouverites not to take in an interesting-looking talk on rock art of the Stein River Valley tonight, sponsored by the Archaeological Society of British Columbia, “Vancouver Chapter”. 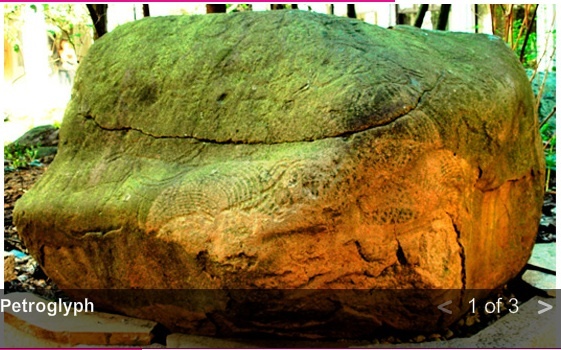 Rock art is found on every continent and is part of the cultural heritage of many peoples but there are few places in the world where direct historical and cultural continuity exists between those who made the art and the contemporary people. In places where this continuity does exist knowledge regarding rock art is controlled and not always accessible to non-indigenous people. When access is made available and information shared there can be prejudice towards indigenous ways of knowledge in favour of fashionable (historically contingent) theories of researchers. Early 21 century research shifts from a hermeneutic rock art research to a rock art science that combines forensic archaeology with Indigenous theory. 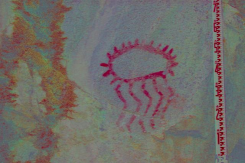 My presentation will trace the dynamics of rock art research over a 125 year period in a place renowned for its rock art, the Stein River Valley of British Columbia, and suggest that the combined interests of researchers and indigenous people has potential to produce mutually constructed histories. I had the pleasure of serving on this month’s ASBC speaker’s graduate committee and I know if you are in the Victoria area you will be entertained and educated at this talk – which unfortunately I can’t make due to pre-existing public speaking commitments of my own. Genevieve has recently been featured on the cover of New Scientist magazine and there has been something of a global storm of publicity stemming from her Master’s research. Pacific Forestry Centre, 506 West Burnside Road. Making the Abstract Concrete: The Place of Geometric Signs in French Upper Paleolithic Cave Art. In Paleolithic cave art, geometric signs tend to outnumber figurative images and yet, they remain relatively understudied. To address this gap in our knowledge, I compiled a digital catalogue of all known geometric signs found in parietal art in France, and then trended the results looking for patterns of continuity and change over time and space. I focused on parietal art, as I could be certain of its provenance, and picked France as my region due to its abundance of decorated sites and its natural boundaries of water and mountain ranges. The database is searchable by a variety of criteria such as sign category, method of production, date range, site type, geographical coordinates and region. It is now being converted into an online resource. To provide a visual dimension, it includes a selection of linked photographs and reproductions of the different signs. In this thesis, I detail the chronological and regional patterning in sign type and frequency and the implications of these patterns for understanding where, when and why the making of these signs was meaningful to the Pleistocene peoples who created them. Biography Having been interested in the cognitive evolution of modern humans since her undergraduate days at the University of Victoria, Genevieve von Petzinger was finally able to explore this in more depth at the Master’s level. Working with Dr April Nowell, again at the University of Victoria, she was able to pursue this interest, and received her MA in June 2009. Using the geometric signs of Upper Paleolithic rock art, Genevieve discovered some very interesting information about these early examples of symbolic behaviour, and presented her findings at the Paleoanthropology Society meeting in Chicago, Illinois in April 2009. This presentation was the catalyst for her research being featured as the Feb. 20th, 2010 cover story in New Scientist magazine. This exposure then led to a strong media follow-up, which included an interview on the Discovery Channel, a feature in the Tuttoscienze supplemental of La Stampa in Italy, an article in the Globe and Mail, and a full page feature in the Vancouver Sun, as well many other popular press articles and radio interviews in French and English, both nationally and internationally. While being slightly overwhelmed by all the attention, Genevieve has been very excited about the positive response, and is just thrilled that other people want to hear her talk about her favourite subject! Major landslide scar near Kwalate Village. Source: panoramio user Obslord. Yesterday’s post about Marianne Nicolson’s powerful pictograph in Kingcome Inlet and the post from a few days ago about the enormous Tsunami in Lituya Bay got me thinking again about recent work in Knight Inlet on the central B.C. Coast (map). “About three generations ago, or possibly at an earlier date, a large portion of the mountain opposite Kwalate Point slid into the inlet causing a huge tidal wave which wiped out all of the inhabitants of the village opposite…and the vast slide is noticeable today”. Marianne Nicolson is a member of the Dzawada’enuxw Tribe of the Kwakwaka’wakw First Nations. She is an internationally-known contemporary artist, and a Ph.D. candidate in the Departments of Linguistics and Anthropology at the University of Victoria. Her work is outstanding and profound and if you get a chance to see her studio pieces, then by all means do so. One work you will not be seeing in a gallery anytime soon is her massive pictograph, Cliff Painting, near the head of Kingcome Inlet in her traditional territory (map). The work is over 15 metres high by 10 metres wide, emblazoned on a prominent cliff as you round the final corner heading into Kingcome (video, scroll down). It formed the focal point of the book by Judith Williams Two Wolves at the Dawn of Time, which is highly recommended. Painted using scaffolds lowered from above the cliff, the work is a profound statement of power and energy. The image is of a “copper“, a large shield-shaped symbol of chiefly power, family prestige and spiritual inheritance, among many more nuanced meanings. Many pictographs on the coast are fading away, rinsed by sun and rain, vandalized even. This massive pictograph takes a stance for all the past, present, and future powers of the Kwakwaka’wakw First Nation. Cliff Painting in Progress. Source: The Medicine Project. Lousy conservation at the Vancouver Museum? Shoddy conservation of magnificent petroglyph boulder at the Vancouver Museum. Screenshot from VM website. 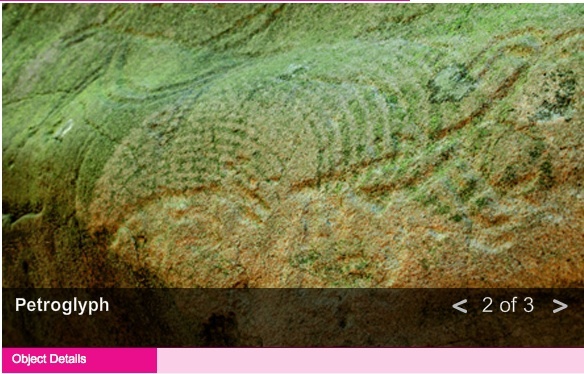 For some reason mistreatment of rock art just makes me spitting mad. 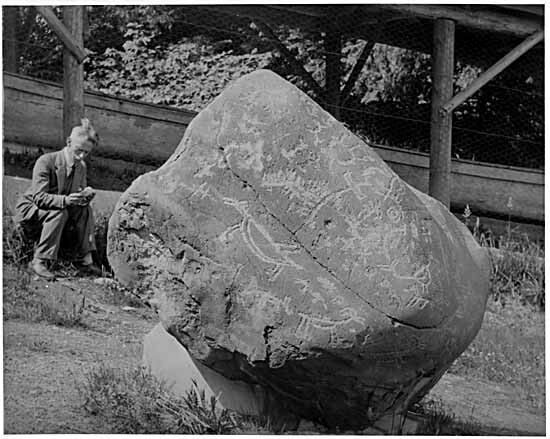 I posted the other day about a magnificent petroglyph boulder that was removed from its home on the central Fraser River near Lillooet in 1926. Bad enough that this work of art was ripped from its setting to be a curio in an urban park. Petroglyphs are not ornaments for your outdoor rock garden any more than they are lifestyle amenities deployed as advertising copy, even if you are a museum. Now my spies tell me that this petroglyph boulder was moved to the Vancouver Museum in 1992. Pictures of the boulder on the VM website show it to be in absolutely appalling shape. It is covered with moss, the designs are visibly eroded and faint, there are signs of exfoliation, and the large crack seen in 1926 seems to be getting larger. The Vancouver Museum appears to be keeping this treasure in a damp, shady, spot in the outdoors (as they say, it is in a “lower level garden courtyard”) and there is no sign of any attention to basic, fundamental conservation responsibilities. They even have the gall to note in their website description “Today archaeologists are reluctant to reveal the locations of petrogylphs, lest they be disturbed.” Well I am revealing the location of this petroglyph, which is being disturbed by careless curation! Vancouver Museum, you have a responsibility of professional stewardship. Are you living up to it? Note the eroded engravings and extensive moss/algae cover. Source: VM website screenshot. The boulder in the early 1930s, soon after it was brought to Stanley Park. Note the crispness of the designs and the lack of moss. Northwest Coast carvings on cliff near Descanso Bay, Gabriola Island, British Columbia, in engraving made 1792. Notes:	Photograph of engraving of explorers and indians viewing a carved head and other petroglyphs on the side of a cliff. The caption says it is a view of a natural gallery, one hundred feet long, and ten feet wide near Descanso Bay. I presume this is the “Malaspina Galleries” near the ferry terminal – I didn’t know there was rock art there though and maybe there isn’t, anymore. Perhaps this place, or this one? 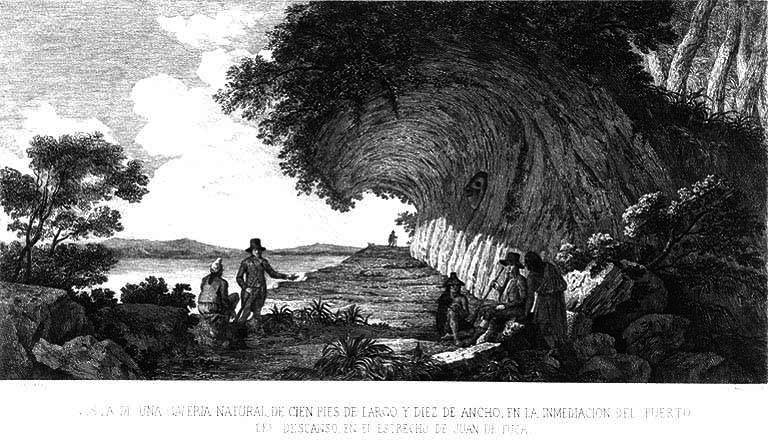 Or, perhaps the unusual pitted and pocked natural sandstone fooled the Spanish, though it sure looks like there is a large image in the middle of that engraving. Quick, Gabriolans, trot down there and check it out. Malaspina Galleries, Gabriola Island. Photo: Kevin Oke. Beside Highway 3 near Keremeos, a large glacial boulder has myths attached that extend far into B.C.’s past. It’s our own Stonehenge but it’s defaced with graffiti. Not far away, somebody jackhammered out of a cliff face one of the most significant ancient rock paintings in North America. Near Campbell River, another cultural site of great significance to first nations — the Big Rock — is also covered with graffiti. On Saltspring Island, effluent filters through a grave site with government approval. Near Qualicum, the bones of persons of great importance were mixed into paving material for a parking lot. We pay lip service to first nations culture; we trot it out when we’re on the world stage — at the Olympics, for example — but our actions betray our venal hypocrisy. When conflicts arise between private commercial gain and public protection of our now-shared ancient heritage, money seems to trump culture almost every time. I use the term “our” to describe this heritage because we are all citizens of B.C. together, first nations and settler society, fused by our braided history. We have one shared narrative in this province. It is composed of many stories. They begin not with the recent arrival of European adventurers or Asian monks but in a far more ancient past. When we permit the desecration of important first nations sites, it’s our shared history that we abuse and our children’s legacies that we steal. I am not convinced that the private member’s bill to which he is refers is the answer, and in any case it died on the vine – more on that later. And the BC Archaeology Branch is kept on a short leash through the expedient of under-funding. But I certainly appreciate Hume’s take-no-prisoners attitude – we need a few vocal bulldogs on the case. Incidentally, in a parallel universe to this blog, Hume’s brother is in a UVIC archaeology class right now, so maybe another bulldog can be raised – it seems to run in the family. Notably, it looks like there is a move afoot to designate the Big Rock, spearheaded by Frank Assu of Cape Mudge. Let’s hope this succeeds, and maybe we won’t see it get dressed up again as a pumpkin. Vandalized Pictograph Boulder near Keremeos.